Anne McAllister's Blog! : And the winner is . . . Me! There have been daily contests over on Kate Walker's blog in celebration of her 50th book (though the length of time this celebration has been going on makes you think Kate will have written her 100th by the time we all get done dancing in the streets -- or swimming in the case of UK writers). And earlier this week, I won one! 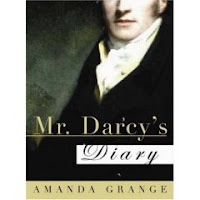 This is particularly cool because the contest I won had as its prize, Mr Darcy's Diary by Amanda Grange. Amanda, who has written a number of straight regencies, has also created a sort of sub-genre with her diaries written from the point of view of literary heroes. 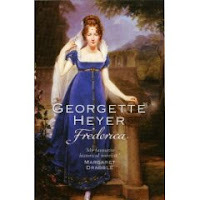 She has written Mr Darcy's Diary, and Mr Knightley's Diary, and Captain Wentworth's Diary. And she has Edmund Bertram's diary in the works -- or maybe even finished. And what a treat to get to get inside each hero's head. I can hardly wait for Mr Darcy to swim across the pond -- or fly across in this case -- so I can read his innermost thoughts. The other cool thing about this is that I won by telling who my favorite hero was. Literary hero. Get your mind out of the towel! And I had to do a lot of long hard thinking about this as you might imagine. It's not easy to narrow down a lifetime's worth of work and come up with one. Well, in fact, I couldn't. I came up with three. (Besides Mr Darcy and Captain Wentworth who seemed to have cornered the market). Mine were Luke Turner from Lisa Gregory's The Rainbow Season, and two of Georgette Heyer's wonderful sardonic gentlemen, the Marquis of Alverstoke from Frederica and Max Ravenscar from Faro's Daughter. It was Max that won the contest for me. Amanda lov es him, too. I suggested she write your diary, too. But she reminded me that you are not out of copyright. Sigh. I can only wish. In the meantime, I've put the TBR pile on hold while I go back and re-read your wonderful book! I can't believe you put up a picture of Hugh Jackman with this post, because I've always thought he would make a great Wentworth. He has an air of the outdoors about him - it must come from him being Australian! - and I could imagine him captaining a ship. At the same time, he's perfect as a romantic hero and I could also imagine him saying to Anne, 'You pierce my soul'. Ah, yes, Hugh as Wentworth . . . mmmm . . .
Well, there is a long-standing Hugh-in-a-towel thing that has been going on since Kate Walker and I were in Australia at their RWAustralia conference three years ago. She brought an overhead projection piece of the above photo (or another one of Hugh in that scene, forget which)and we shared it -- using it to punctuate our talks. It was one of the most memorable bits of that conference (as you might imagine). And we've been hauling out Hugh-in-a-towel ever since on appropriate occasions. And believe me, there are a lot of appropriate occasions! And yes, Hugh as Wentworth -- oh my! I can see it now. I like Ciaran Hinds, but Hugh would be The Best. I'll keep him in mind when I read Captain Wentworth's Diary. Thanks for suggesting him. Hugh might make Max Ravenscar, too. If he could look sufficiently sardonic. And I suspect he could if pressed. I suspect that Hugh could even look sardonic in a towel! Hugh sardonic in a towel. Ah, yes. Definite fodder for the mind's eye. I'd love to see Deb Grantham locking him in the cellar! 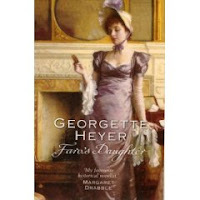 Why is no one making films of Georgette Heyer books? Surely with all these Jane Austen revivals, a few good Heyers would be naturals for the screen.